Unlike a full studio, this installer does not have to install VS IDE Core and, accordingly, through BuildTools you will not install a visual development environment. Through this, an attempt is made to reduce the weight of the installer and reduce the size and impact on Windows. BuildTools does not provide any additional features (i.e., it is of the type "toolchain from small-sized ones" … it would seem to me that this modification should be called so that everything would be clear at once … but apparently the desire to be unique and inimitable prevents them from quietly using available terms). If you try to install languages ? ?other than English (if specialists do not control it, then this is exactly the situation), then you will most likely not be able to upgrade without the Internet (and you can reinstall it). Those. 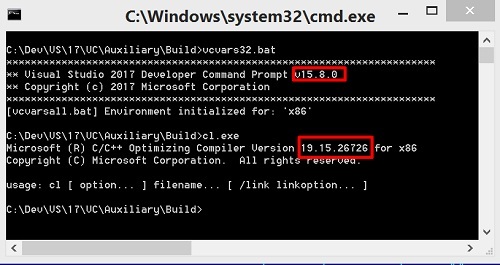 either without Russian, either we demolish and re-install the required version 15.8.x or to install you will need an Internet connection. Glory to the completeness of testing the offline installer is lightweight! The latest Windows 10 SDK is available. NuGet packages for Intellisense are broken. Visual Studio closes after opening sln. App.Config XML editor still freezing in 15.8.4. The latest Windows 10 SDK (build 17763) is now available as an optional component for the Universal Windows Platform development workload. You can add this SDK to the workload by selecting the Windows 10 SDK (10.0.17763.0) checkbox.